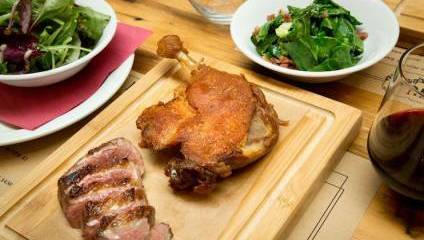 Monsieur Le Duck Review: Feeling ducky? The hectic pace of London can make you feel like a little duck sometimes: calm on the surface, but paddling like hell below. Luckily, we’ve found the joy of a slow pace in Monsieur Le Duck, a new pop-up restaurant located where the City meets Shoreditch which champions the joy of taking time out to sit back, relax, and eat a lot of delicious duck dishes. Monsieur Le Duck is the brainchild of Londoner Richard Humphreys. A frequent visitor to Gascony, Humphreys wants to bring a touch of the douceur de vivre (sweetness of living) synonymous with south-western France to London. Bringing that ideal to the heart of the City is no mean feat, especially when one of London’s big banking buildings is your neighbour. However, Monsieur Le Duck manage to transport you to that distinctly French atmosphere of long luxurious mealtimes where food and drink is to be savoured, not wolfed down on the go, making it particularly welcome in such a notoriously bustling location. A warm atmosphere is cultivated as soon as you step inside thanks to the friendly team, the exposed-brick décor and quaint checked cloth napkins and curtains. Monsieur Le Duck’s signature cocktail, the Pousse Rapiere, which combines Armagnac and fizz, turns out to be a delicious alcoholic incarnation of the warm atmosphere, and is a great way to start the evening. Now, you know you’re onto a winner when a big basket of bread is brought out to you without asking for it, but the MLD team levelled up with the inclusion of duck fat butter. Duck. Fat. Butter. Like regular butter getting a Queer Eye makeover to make its inner buttery fabulousness even better. Having resisted filling up on bread and butter, we tried a selection of everything on the small but carefully curated mains menu. Portions are hearty and served with a generous helping of fries and your choice of sides, including our perfectly-balanced selection of greens with lardons. Accompanied by a rather quaffable carafe of red, we started with the duck burger. Juicy with a tasty relish, the burger is a good choice for anyone not wanting to dive too deep into duck territory. With this in mind, the stars of the show were the confit de canard and the magret de canard. The former was everything a good duck confit should be: crispy and flavoursome skin with succulent flesh, and the pan-fried breast of the latter was melt-in-the-mouth. By the end of the evening we could certainly see why the tradition of long mealtimes exist in Gascony - if the food is always as delectable as this, then we’re surprised anyone can move after they’re finished. We just about managed to find room for the tarte aux pommes, the ideal end to a gastronomical trip to the heart of French cooking, its delicate apple flavours merging with the light sour cream. Monsieur Le Duck certainly brings a little sweetness to the City, and will be a treat for any meat lovers who want to branch out from steak and burger joints. Why not come and have a go - if you think you’re canard enough.